Accent any exterior environment with the distinct style of these 36"Dia. x 24"H outdoor concrete planters. 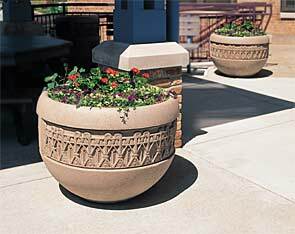 Select from the 9 unique Cast Band options to customize the look of your planters. Add the optional reservoir system to extend plant lifespan while reducing the frequency of watering.